(Courthouse News) A federal judge has halted the Trump administration’s updated policy on public participation in the process by which the Bureau of Land Management decides whether to grant oil and gas leases in habitat of the greater sage grouse. U.S. Chief Magistrate Judge Ronald E. Bush ordered the bureau to adhere to its prior policy of robust public engagement in the lease approval process. “The record contains significant evidence indicating that BLM made an intentional decision to limit the opportunity for (and even in some circumstances to preclude entirely) any contemporaneous public involvement in decisions concerning whether to grant oil and gas leases on federal lands,” Bush wrote in a 57-page order issued late Friday. The ruling is a major victory for the two plaintiffs – environmental organizations Center for Biological Diversity and the Western Watersheds Project – which seek to restore what they claim is the public’s right to weigh in on important decisions that could affect the integrity of public lands in the American West. “The BLM was cutting the public out of oil and gas decision-making, and we’re grateful to Judge Bush for restoring the public’s ability to have meaningful input,” said Erik Molvar, executive director of Western Watersheds Project. The conservationists argue changes to public participation policies are meant to exclude the public from the decision-making process, making it easier for oil and gas companies to exploit public resources for private gain while fouling the natural environment. Interior Secretary Ryan Zinke has been upfront about oil and gas development on public lands being a priority for President Donald Trump in his quest to make the United States a dominant force in the global energy market. “The pilot light of American energy has been re-lit by President Trump, and the president’s energy dominance strategy is paying off,” Zinke said in a statement released around the time the lawsuits were initially filed in April. Zinke has also argued royalties from oil and gas projects on public lands help fund conservation efforts. According to the secretary, the changes to approval processes are not meant to exclude the public but to streamline the applications and make processes more predictable for industry representatives. Bush’s grant of a preliminary injunction, which the law categorizes as “an extraordinary remedy,” means he believes the plaintiffs are likely to prevail and that the damage done in the meantime is such that putting an immediate stop is necessary. “The court concludes that plaintiffs have shown a substantial case for success on the merits of their claims and that irreparable harm is likely to result in the absence of an injunction,” Bush wrote. The government attempted to argue that their new public participation policy, formally known as IM 2018-034, was not a final agency decision but a simple statement of general policy. Neither the Bureau of Land Management nor the Justice Department responded to requests for comment by press time. Bush made clear that his injunction only applies to the oil and gas lease decisions that affect the greater sage grouse habitat. And his decision does not end the case. The sage grouse, with its distinctive and inimitable mating dance ritual, has steeply declined in population over the past 100 years, largely due to habitat destruction by energy development and home-building across sagebrush ecosystems. According to the Fish and Wildlife Service, sage grouse once numbered up to 16 million birds spread across 16 western states and three Canadian provinces including British Columbia, Alberta and Saskatchewan. Today, population estimates range from 200,000 to 500,000, and the bird is recognized as endangered by a variety of state-sponsored and independent wildlife organizations. 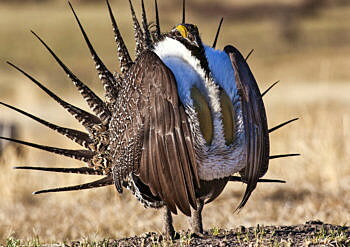 Although the federal government considered listing the sage grouse under the Endangered Species Act during the Obama administration, Republican-led states like Utah, Nevada and Wyoming opposed the move. All three states have substantial amounts of federally managed land that would be subject to more stringent land-use restrictions if the sage grouse received listing. Conservationists pushed back against the economic arguments, insisting that preserving an iconic species of the American West overrode such concerns. Sally Jewell, who headed the Interior Department under President Barack Obama, eventually fostered a compromise that stopped short of listing the sage grouse under the Endangered Species Act, but stipulated various grouse habitat protections on federal land throughout the West. After Trump appointed Zinke, the new Interior head backed off of Jewell’s solution in favor of plans that conservationists criticize as too industry-friendly. While the preliminary injunction applies strictly to public participation in the processes, it’s part of a broader lawsuit that fundamentally challenges the Trump administration’s legal right to develop oil and gas in the sage grouse habitat.